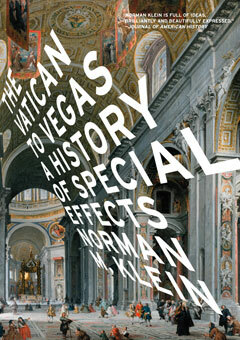 A guided tour through the magical world of illusions, The Vatican to Vegas takes the reader from lavish Baroque fantasies of the seventeenth century to the Electronic Baroque of today. The “scripted spaces” described by Norman Klein are punctuated with devices widely used in special effects: shocks, surprise twists, grand fakes, and copies. These elaborate deceptions allow the viewer to assume the role of a central character. But, as Klein points out, real power in this world of fakery rests with whoever controls the illusion—be it the pope, the president, the imagineer, the designer, or the studio executive. In these pages, we journey from architectural illusion 1580 to the tromp l’oeil of today’s Las Vegas casinos. Along the way, we encounter systems of Renaissance software, anachronistic skyscrapers from the early nineteenth century, toys that inspired steam-driven cars, and fireworks that illuminated the skies of Rome in 1740’s. Klein’s research takes us from Piranesi’s labyrinths to the mazes of new computer software, from scrolling panoramas that staged the horror Gettysburg to the endless special effects on cinema screens today, where the world is regularly blown to atoms. Here is an alternative history of power and optical, architectural, and cinematic codes, cleverly manipulated by the author in a way that allows us to experience, as well as understand, the seductive play of special effects upon the psyche. Throughout, Klein demonstrates how special effects are not only a barometer for politics, myths of identity, and economic relations, but also an instructive parallel for understanding where our civilization may be headed next.